We are quite experts with our eating behavior. We know we should eat two pieces of fruit per day, about 200 grams of vegetables, and of course we shouldn’t drink alcohol or smoke. There is no need to tell anyone that fries, ice-cream, candy, or big chunks of chocolate are very unhealthy. We know, we know already! We are tired of hearing how many calories a Big Mac contains, or how many spoons of sugar there go in a bottle of coke. We all know what is healthy, we all know what is unhealthy. But I don’t know anyone who only eats healthy. Everybody likes to snack, a lot of people drink alcohol. Nonetheless, we all want to be slim, be strong, be healthy, live long and happily ever after. Why can’t we? Why is it so hard to achieve this lifestyle if we know what to eat. What is there more to eating than our rational mind? We know what to eat, but we can’t achieve this, so we should go a deeper level. This levels focuses on the “why?”, why do we eat? What are exactly all our reasons for eating? This will make us better understand our eating behavior, and might tell us why we aren’t eating apples all day. Therefore, I have been keeping a “reasons to eat diary” for 15 days to figure out; why do I eat? For 15 days, I kept a sheet of paper with me. On this paper I wrote down what I ate, the time that I ate it, and wrote down my the eating reason for that eating moment. During 15 days of tracking I had 103 eating moments. That comes down to 6.9 eating moments per day on average. I found out that for one eating moment I can have several reasons. For example, I like to eat a pear, but they are also healthy too. When someone offers me cake, I eat it because it’s rude to say no, but also because it might look quite delicious. On forehand I figured several of reasons for eating and while logging I experienced some extra reasons for eating my food. I summed the up these reasons, analyzed these in SPSS and plotted the results in Excel. The first thing I found that on average I have 6.9 eating moments per day. So only breakfast, lunch, and dinner doesn’t do it for me. I need more than that, I need/want to snack. But why do I do this? In the next table you can see my basic eating reasons with their percentages. All, and all I found six reasons to eat. Other people might have other reasons, but these were mine. But what do these reasons mean exactly? It looks like my main condition for eating something is the taste of the food. 86% of the time, one of the reasons for eating something is just because I liked the taste. A little more than half of the time (55%) Ii ate something because I was hungry. This would be one of the main reasons we would expect of a normal human being. More shockingly, 45% of the time I ate something when I wasn’t hungry. Two pieces of fruit per day is recommended? Okay, I’ll eat a banana. 35% of the time I have health reasons. That doesn’t mean that 65% of my food is unhealthy, it still could be healthy but just wasn’t my reason to eat it. Breakfast, lunch, dinner, those are all the moments during the day when a normal person supposed to eat. However, what if your break time with your colleagues is set to soon? Or your dinner appointment is set at 6:00 pm. It doesn’t always mean that you are hungry at that time. I had the feeling that sometimes (26% of the time) I just ate because I supposed to eat. 35% percent of these times I wasn’t even hungry. 25% of the time I eat for energy. At those moments I just ate because I needed the energy to get me through the day. It’s my birthday, I baked a cake! You can’t say no to that. For me, 7% of my eating moments someone offered me food and I accepted it. When we where caveman we just ate to survive. We only ate when we were hungry. Now it has only become number two of my reasons to eat. We are no cavemen anymore, we are able to eat other things than just grass or raw meat. Or choices of food are overwhelming, there is food everywhere. Of course, when we have the choice what to eat, we eat what we like. Therefore the taste of my food has become my number one reason of my list. The third reason is the health reason. I like to eat healthy, to feel better, to be more productive. Number 4, eating because “I suppose to eat” was quite shockingly high on my list. This concludes that the concept of breakfast, lunch, dinner are very much embedded in my daily eating pattern. 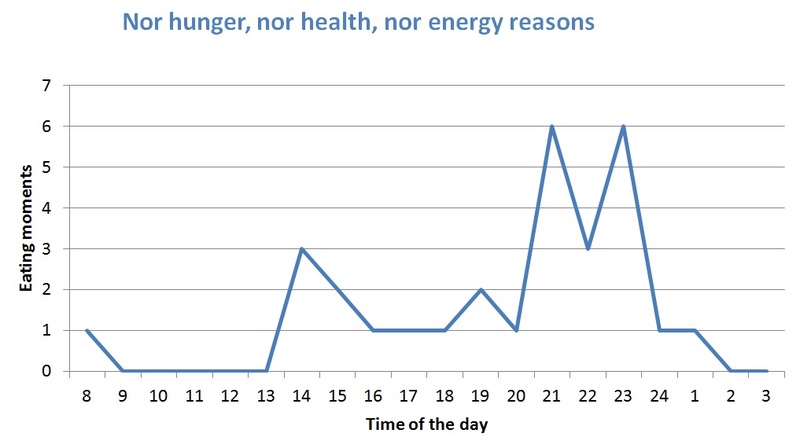 Eating for energy reasons (number 5) happens also a lot during breakfast and lunch, at these times I am not hungry, but skipping these moments isn’t very wise either. Maybe in the future I might try to postpone my breakfast and lunch a little. Reason number six is when I got food offered to me. Personally, when someone offers me food, it is hard for me to say no. Interestingly, the things that I got offered and ate these 15 days were cake, pizza, muffins, and snickers, how convenient. In my opinion, the best eating reason should be “healthy” and “hungry”. In figure 1 you can see the time course over the day of healthy and hungry reasons. My breakfast, lunch and dinner are around 8 am, noon, and around 7 pm respectively. As you can see in the figure these moments are very embedded in my daily pattern. When I am hungry I tend to eat something healthy. These two reasons are strongly related (Ƭ=0,732, p <0.001), that’s a good thing. But on to the better question, when am I acting bad? In my opinion, bad behavior is when I eat something that didn’t need to eat, but still ate. So nor for hunger, nor for energy, and nor for health reasons. As you can see in the next graph, I am most vulnerable for bad behavior during the evenings between 9-11 pm. These are the often the moments when I am at home or when I am with friends. These are very seducing moments for me to come to the dark-side of eating behavior. But how bad is that really? I consider myself as a healthy person, my current BMI is 21.8, that is very much within the healthy range (20-25). The last time that my blood samples were checked the results were very good. So I don’t feel really guilty of my bad behavior. I often watch a movie with some chocolate next to me, or when I go to a party I can’t ignore the crisps on the table. I enjoy this “bad” behavior, it gives me enjoyment and pleasure. It is short time pleasure, but what is life without pleasures? As long as you don’t overdo it to much it is okay. Overdoing it is a second thing, but how can you stop overdoing behavior? Maybe it is important to be consciously aware of how much pleasure you actually receive from “pleasure” food. From which food do we receive pleasure, and how much pleasure do we actually receive from it? Does a bigger portion of pleasure food means more pleasure? I am not sure, but I feel a new experiment coming up. I think it is important to be consciously aware of your behavior. Being aware of your behavior doesn’t make you a healthy person instantly, but it does give you a deeper understanding of yourself. I have become aware of how spoiled I am, how embedded my daily habits really are, and when I am vulnerable for bad behavior. Being aware of your psychological identity behind your mouth is the first step to autonomously changing or breaking your habits. I almost had the urge to change some of my behavior while tracking these 15 days. I can’t really stand the “suppose to” reason, but it something to work on in the future. I choose the things I eat. I don’t buy food which I don’t like. I do like a lot of things. But I like one thing more than another. If you always eat what you like most, the variation in your food decreases, and variation is important. For example, for fruits I like to eat banana’s, but these only contain a specific amount of vitamins. Other fruits like apples contain different vitamins which you might be missing. Supersize me is a great example of this, eating all day at mac Donalds is very unhealthy. However, you should realize that only eating banana’s all day is also very unhealthy. This experiment only considers the direct reasons for eating. Deeper reasons like price of the food, the emotional reasons, and choices between food aren’t mentioned in this study.Furthermore, this experiment doesn’t show the rank of reasons within an eating moment. To conceive more knowledge this might be considered for further experimentation. I really this idea and would be interested in taking it further, especially with regard to emotional eating. Thanks for sharing! Thanks for you comment, I am working on it!